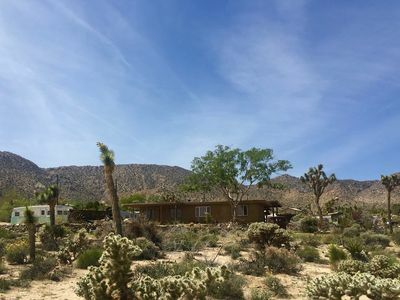 Book this 1950's Homestead Cabin for your next trip to Joshua Tree, California. 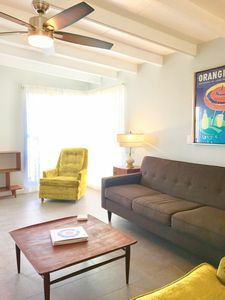 Situated on 5 private and very quiet acres, this 1-bedroom, 1-bath vacation rental cottage is ideal for 4, complete with a kitchenette, an antique soaking tub and free WiFi. 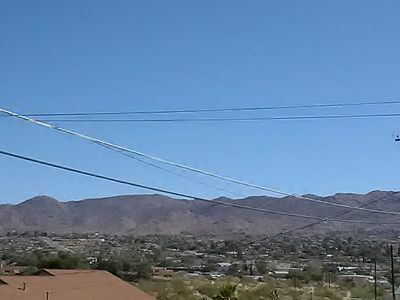 From here you'll be 3 miles from the Joshua Tree Music Festival, and 15 minutes from the west entrance to the National Park. 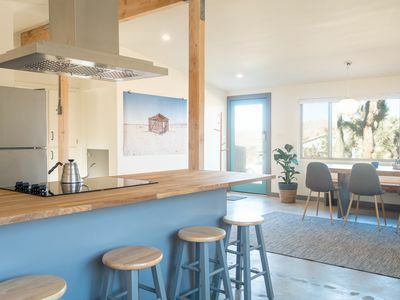 The home is located on a rise with fantastic 360-degree views of the Mojave desert and amazing stargazing opportunities. 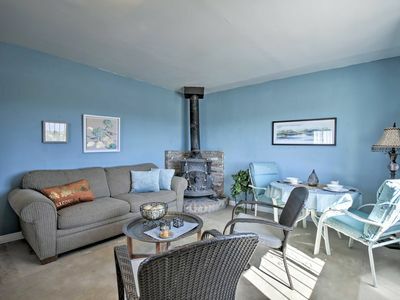 This cozy cottage offers a peaceful respite for up to 4 guests. 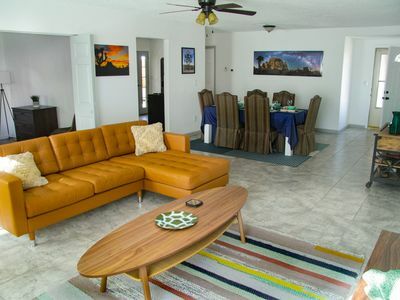 You'll have everything you need to be comfortable during your stay, including essential appliances, 5 private acres, and a private entrance. 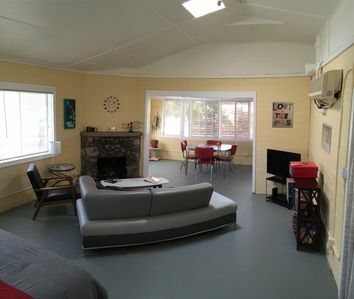 The living room hosts a cozy sofa that folds out to a queen sleeper, as well as a wood-burning stove. 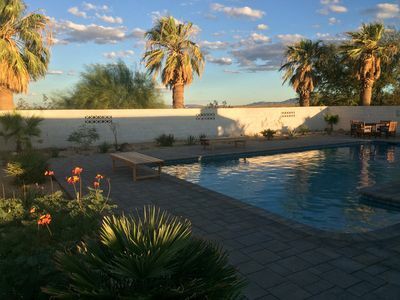 Kick back and relax before heading out to Joshua Tree National Park! Stock up on groceries and enjoy home-cooked meals anytime you want. 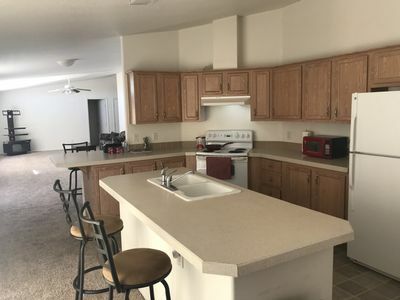 The kitchenette is well-equipped with a refrigerator, freezer, stove, oven and more. Enjoy meals at the dining table. In the evening, take a seat outside and gaze up to the stars. When you're ready to rest and refresh, utilize the shower then claim the inviting California King bed or you can snag the queen sleeper sofa. 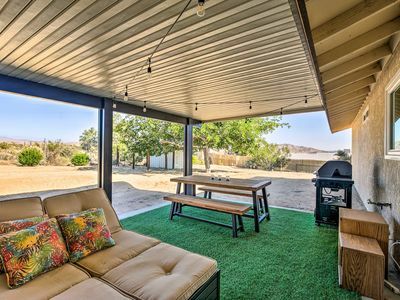 While this home is situated in a private area, you'll be ideally situated near the best of Joshua Tree. From famous attractions to festival grounds and more, you'll have plenty to see and do during your visit. 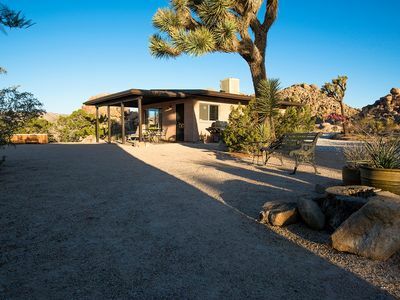 Explore Joshua Tree National Park just 15 minutes away. Book a geology motor tour, go rock climbing and mountain biking or bring your camera and spot more than 250 species of birds. 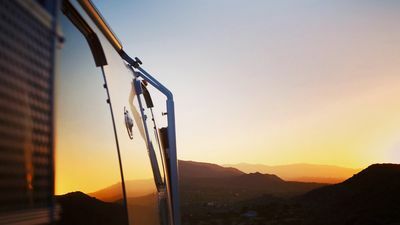 If you're in town for a festival, you'll be pleased to know that the Joshua Tree Music Festival is just 10 minutes away. 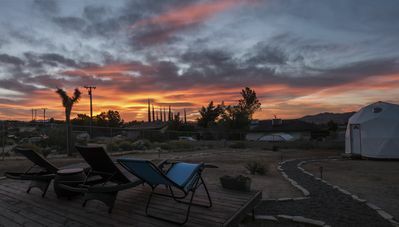 These grounds are also the venue for the 2019 Bhaki Fest and the Joshua Tree Astronomy Arts Theater. 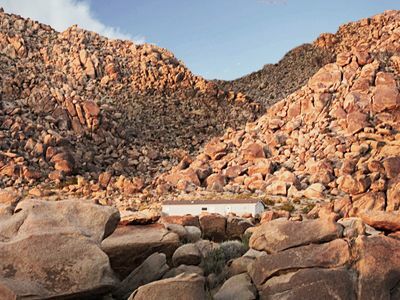 Additional attractions include the Noah Purifoy Outdoor Desert Art Museum 10 minutes away, Integraton 20 minutes away, Pappy & Harriet's in Pioneertown 40 minutes away. 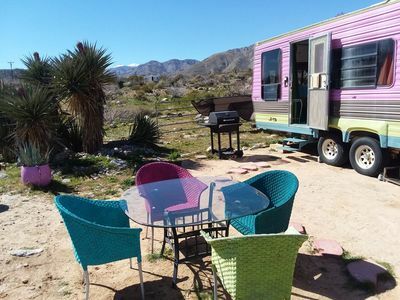 For a bite to eat, head to a cafe in downtown Joshua Tree. There you'll find plenty of food options, eclectic shops, and even a Saturday farmers market. 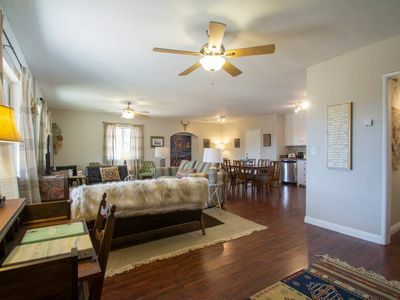 Spacious home, centre of town, 1 min to ranger station, wi-fi, A/C ! 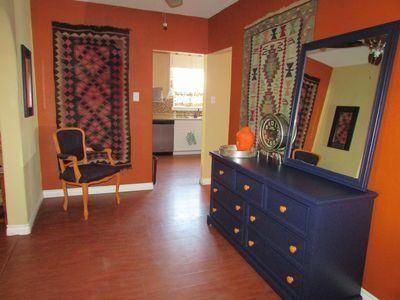 Enjoy peace, privacy and quiet nights, conveniently located close to the park. 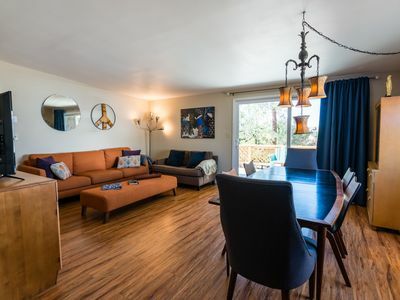 Chocolate Coyote: Vista Views,Prime Location,Modern... Vintage decor. 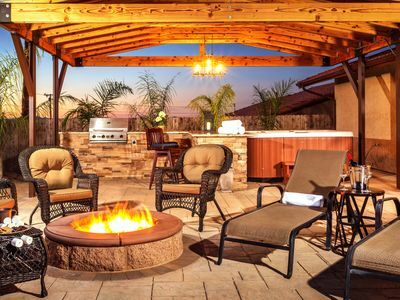 Rustic Home w/ Grill+Views - 4 Mi. to Joshua Tree! 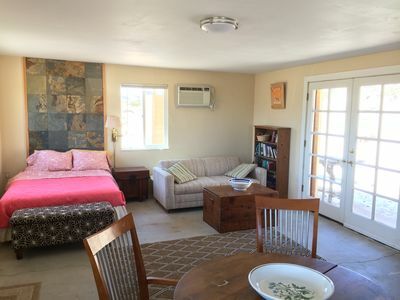 Spacious Joshua Tree 3 bedroom 2bath home perfect for families and pets.